The Government Procurement Reform Law (R.A. 9184) passed in 2003 sought to improve the process of government procurement by requiring measures to make it open, competitive, and transparent. One measure for improving transparency and accountability was the requirement to have observers from the private sector and civil society present at BAC proceedings. The Evelio B. Javier Foundation, Inc. (EBJFI) was one of the organizations that sought to prepare the participation of such observers by conducting orientations and trainings. However, EBJFI discovered that despite the increase in the number of trained observers, a problem in the commitment of CSOs and private sector groups to observe and monitor the operations of BACs was recurrent. This led EBJFI to initiate the building of a partnership between government and civil society to institutionalize the CSO BAC observers in the provinces of Davao del Sur and Cebu, in an activity referred to as the Interface. 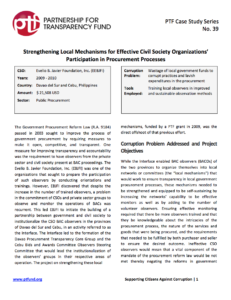 The Interface led to the formation of the Davao Procurement Transparency Core Group and the Cebu Bids and Awards Committee Observers Steering Committee that would lead the institutionalization of the observers’ groups in their respective areas of operation. The project on strengthening these local mechanisms, funded by a PTF grant in 2009, was the direct offshoot of that previous effort.